Prompt: Weather apps are the new UI design playground. Now it’s your chance to take a crack at designing one. First, what kind of weather app do you want to design? Pick from one of the prompts as your starting point. Next, decide how you’re going to tackle this particular problem. Will it be a web site? A mobile app? Something else? Lastly, document your concept for us. We understand that this is only a rough concept. It doesn’t have to be beautiful, but we do want understand the thinking behind your design. The first screen the user sees is the full weather forecast for the current date. It shows highs/lows, current temperature, the week ahead, and more information such as the sunrise/sunset times, precipitation and visibility. The main features on this page is the ability to scroll through the day and see the weather at different times and also visually see the temperature rise and fall throughout the day. 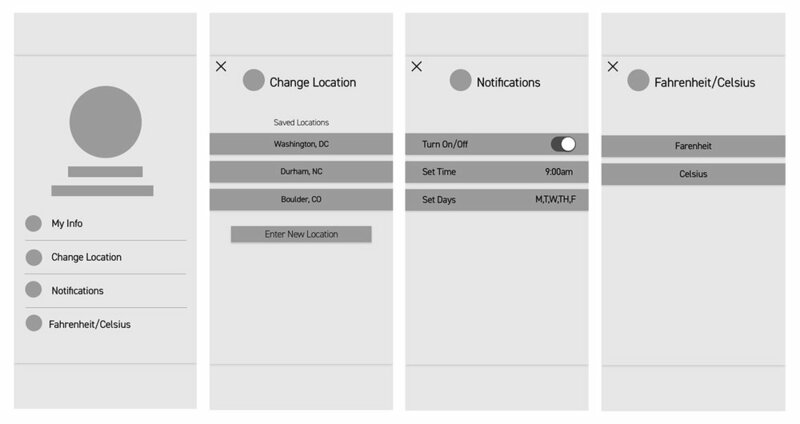 The settings screen gives the user the ability to change their information, change location, set and change their notification settings, and change between fahrenheit and celsius. On the change location screen there is the option to enter a new location or select from saved locations. One of the main features that separates this application from other weather apps is the push notification feature. This sends a notification to the user telling them the basic overview of the weather that day, and also makes suggestions of what to bring with them to prepare for their day.